Go green and swap your tortillas for collard greens. Unlike lettuce wraps they are massively sturdy and can handle a serious load. 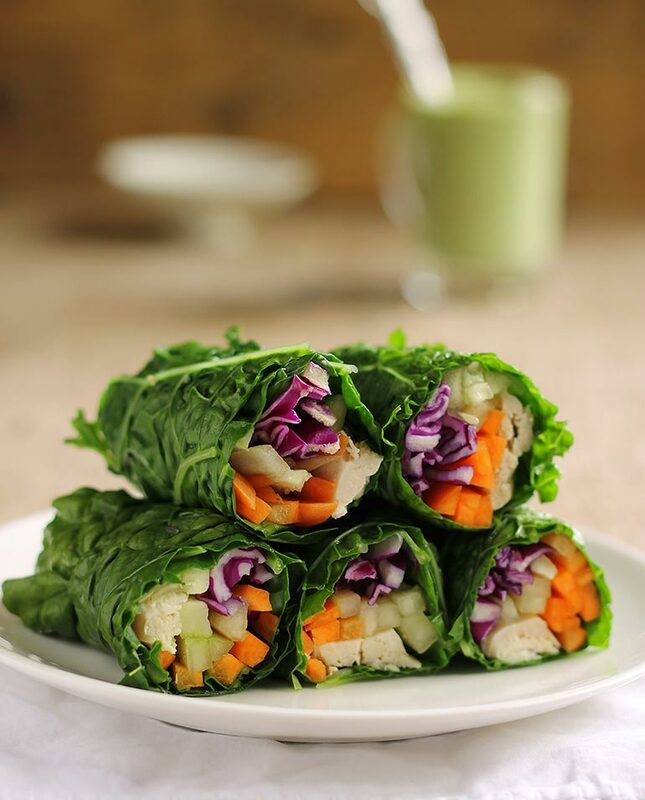 Rolled-up collard green wrap make for a healthy lunch or even a light dinner. This gluten free, low-carb wrap is made with collard greens, instead of tortillas. Not only does it save you carbs and calories, but collard greens are rich in nutrients. Collard greens are also a great source of soluble fiber, which isn’t just good for your gut, but helps make this wrap super satisfying. Go green and swap your tortillas for collard greens. 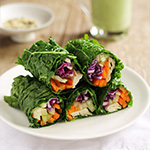 Rolled-up collard green wrap make for a healthy lunch or even a light dinner. Wash thoroughly collard leaves, slice off the stem and with a sharp knife, remove the thick part of the large vein. Cook the collard for 45 seconds in salty boiling water. Drain and rinse with cold running water to stop further cooking. Let it cool. Cut in half and set aside. In a large bowl combine the olive oil, garlic, orange juice, honey and salt. Add in the red cabbage and gently toss. To assemble the rolls, take each collard wrap and place an even amount of the cooked chicken, red cabbage, carrot and cucumber and tightly roll as sushi. Serve immediately with sauce of your choice.